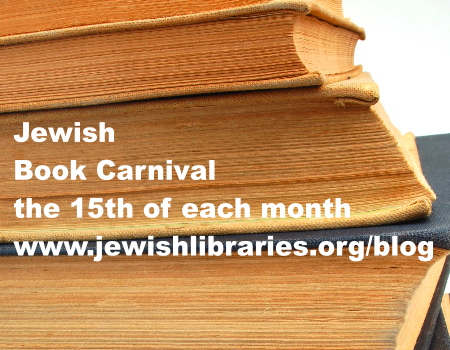 On the 15th of each month, a blogger hosts the Jewish Book Carnival. Today, The Whole Megillah is proud to host this month’s Carnival . For those of you who may be new to the Carnival, it is a blog event intended to inspire lovers of Jewish books to meet, read, and comment on each other’s posts. My Machberet will host the June carnival, so please submit your entries to blogger Erika Dreifus no later than Friday, June 10. On My Machberet, Erika Dreifus writes about the next book on her TBR list: Janet Kirchheimer’s poetry collection, How to Spot One of Us. Sheryl Stahl, contributor to the Hebrew Union College library blog shares a link from Needle in the Bookstacks that talks about an 18,000 book gift from the estate of Elliot Sachs. This entry was posted in Authors, Book Reviews and tagged An American Radical, Andrea Myers, Ann Koffsky, Book Frontiers, Book of Life, Claire Nivola, David Bezmozgis, David Levy, Emma's Poem, Erika Dreifus, Folktales of the Jews, forwordsbooks, Hebrew Union College, Heidi Estrin, How to Spot One of Us, Illana-Davita, interfaithfamily.com, Janet Kirchheimer, Jewish Book Carnival, Jewish Book Council Book Blog, Jewschool.com, Kathy Bloomfield, Linda Glaser, Lorraine Lotzof Abramson, Lydia Schultz, Margarita Engle, My Machberet, My Race, Needle in the Bookstacks, Susan Rosenberg, Sylvia Rouss, Talia Carner, TaliaTellsTales, The Choosing, The Free World, The Whole Megillah, Tropical Secrets, Yaldah Publishing. Bookmark the permalink. Thanks, Erika, for helping to get the word out! Thanks a lot for your work and for including my post. It’s my pleasure! And thanks for submitting a link.